At 40, in my homeland, I painted, collaged and signed, Vous êtes à Pudduchcheri, M.T. Karthik, on the back of the wood liquor cabinet installed in a wall at Qualithe’s Hotel Bar in Pondicherri, Pudduchcheri, Tamil Nadu, India in three weeks in May, 2007. The image of the moon is an actual photograph taken in 1971 by telescope from observatory of the University of Montana. The oil well is from the back of the old,purple Indian 1-rupee note. I photographed the haliastur indus (brahminy kite), pair, myself, from my studio for nine months, and then printed and selected the images of the two raptors collaged into frame – male and female. The palm tree was photographed at a local beach as well. The postage stamp is the a magazine reproduction of the first stamp issued by independent India. the detritus on the beach includes a matchbook and wrapper from a package of firecrackers, and the tiger from the tiger balm packaging. 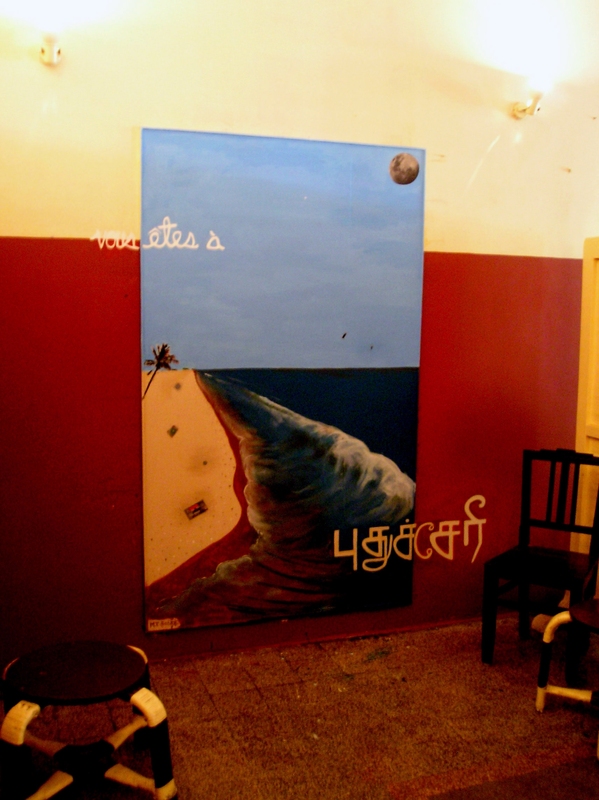 art students from the Chitra Kala Parishath art college in Bangalore, were invited to add depth to the waves and a second heavenly body, a single white point representing Venus, over the sea.